Criollo cacao beans are rare, and Chuao is an even more rare version of Criollo that comes from the plantation of Chuao in Venezuela. It is limited in quantity, so often makers will do limited edition, or signature, bars of it. Part of the cost of these types of bars is the fact that they are made from very rare beans, and often these rare beans are more susceptible to damage from insects, fungus, etc, which make them harder to grow. Only a couple percent of all chocolate bars are made from rare cacao beans. 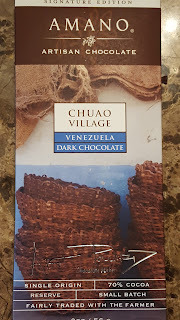 I recently focused on a Chuao chocolate bar tasting, however, I find the Chuao bars seemed to taste better when tasted just one in a sitting, instead of four of them in a tasting. In a group many of the bars almost had a musty taste, but when sampled again alone on other days they really shined. Nose: Light nose, touch of raisin, floral. Texture: Chew a bit before it melts, smooth, creamy. Taste: Floral, orange citrus, dutch cocoa powder, touch of acidity, cream. Finish: Medium finish with mild citrus acidity, and a hint of oak at the end. I’ve had four different bars so far made with Chuao. Have you tried any? Would you try one? What are your thoughts? The best ways to help me keep doing chocolate reviews, and cooking videos is by watching, liking, sharing, and subscribing to my YouTube channel, and sharing links to my blog posts. Let’s get the word out on fine chocolate, so that it remains available in the future! Thank you in advance!! !